I promise that I am not exaggerating when I tell you that this is one of the best soups I have ever made and also one of the easiest. In fact, its simplicity left me suspect after reading the original recipe in Nigella Lawson’s How to Eat, my motivation for trying the recipe came from possessing the exact ingredients in my cupboards in addition to the knowledge that following day would be long and incondusive to hours of cooking time when I arrived home from work. I have further simplified the recipe by doing most of the work in a slowcooker, that way when you get home from work at the end of the day you walk into the most heavenly and woodsy aroma of piney rosemary and buttery garlic – your postwork mood will shift immediately into one of comfort and warmth. When you get home all you need to do is take the rosemary cheesecloth sachet out along with any of the garlic cloves that have floated to the surface, puree 1 cup of the soup with the tomatoes in a blender or food processor and allow to simmer in the slowcooker for half an hour with the dried pasta, stir in the pesto (which you can make the night before) and you’re all set to eat. This soup has such aromatic depth of flavour that I suggest serving it with little more than a baguette with good salty butter or a green salad with some lemon juice, olive oil and kosher salt added haphazardly before eating – you don’t want anything that will compete with the richness of the chickpea and tomato soup, merely something that will provide a simple background of flavours and textures. 2. When you get home take out the rosemary sachet and any of the bruised garlic that is floating on the surface, don’t worry if you think there is still garlic in the soup as its intensity will have completely vanished after cooking for such a long time. 3. Remove 1 cup of the soup from the slowcooker and place in a blender or food processor along with the diced tomatoes and blitz until smooth. Add back into the slowcooker and allow to simmer for half an hour, adding the pasta after 15 minutes. When you’re ready to eat stir a generous tablespoon of parsley and lemon pesto into each bowl of soup and eat with pleasure and in comfort. 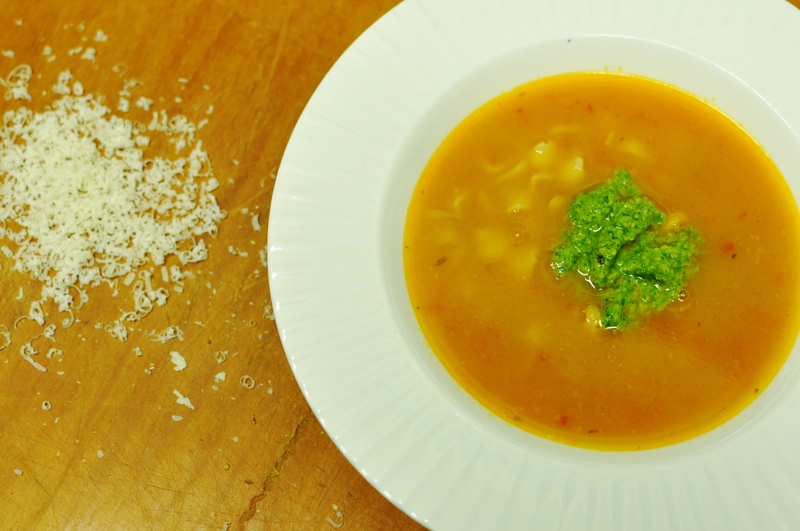 Alternatively, sprinkle some finely chopped parsley and finely grated Reggiano over the soup in place of the pesto. This pesto provides just the right amount of astringency from the parsley and lemon as well as a garlicky intensity that makes the smooth cohesion of flavours in the soup really come into their own. If you have leftover pesto either freeze in ice cube trays or keep stored in the fridge with a thin layer of olive oil layered on top to prevent discolouration and use on linguine with extra cheese. 1. Place all ingredients in a food processor and blitz until smooth, you may need to stop several times to scrape the sides down with a spatula as you blend. Lately I have been listening to Zammuto’s self-titled album constantly, while cooking and while running and while getting ready for work in the morning. I’m hardly surprised that I’ve become such a fan considering the album is by Nick Zammuto, one half of The Books, another band that is heavily featured in any playlist I put together. This song is perfectly and aptly named; joyous, motivating and altogether yay.